Looking towards Isle of Eigg from Aird of Sleat Road, South of Armadale, Isle of Skye. 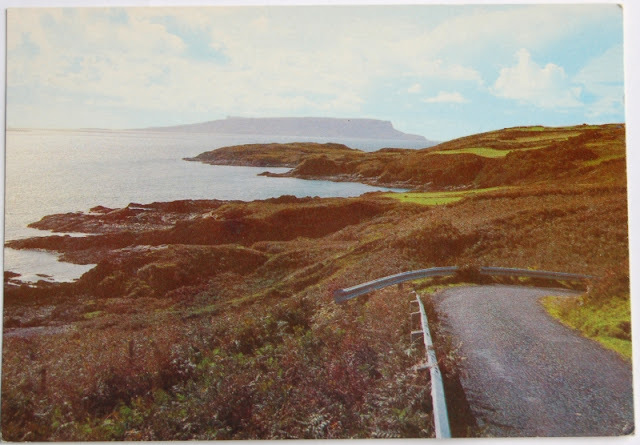 This dramatic coastal road enjoys magnificent views across the south of Sleat to the east and to the south towards Rhum, Eigg and Muck. Provenance: Purchased in Multnomah Village, November 2010. Maybe that's as bright as the colors get? I've seen boringer. Actually, that looks like the perfect turn to kill yourself when you're drunk, admiring the view. Breathtaking. You need a whole category for postcards foregrounding highway guardrails. I'm glad I'm not driving in the out of the frame direction, following the guardrail in low-vis conditions. I was quite taken with the guardrails too. Specifically, I picture a drunken rampage UP the slope on the right, in which case the guardrail will pinball a vehicle directly over the crest and launch one into the bramble and down the slope.